Updated Thursday April 18, 2019 by Paul Young. Monday – Friday from 9:00 am – 3:00 pm, (early drop off available at 8:00 am, late pick-up until 6:00 pm at no extra charge). Camps are typically held at John Muir High School in Pasadena. Please use the entrance for the “big” gym on Wyoming for drop-off and pick-up. John Muir High School gives us access to two gymnasiums. Boys and girls ages 6 - 9 will utilize the "Small" Gym and boys and girls ages 10-15 in our Flyers Elite Camp will utilize the "Big" Gym. Who may participate? 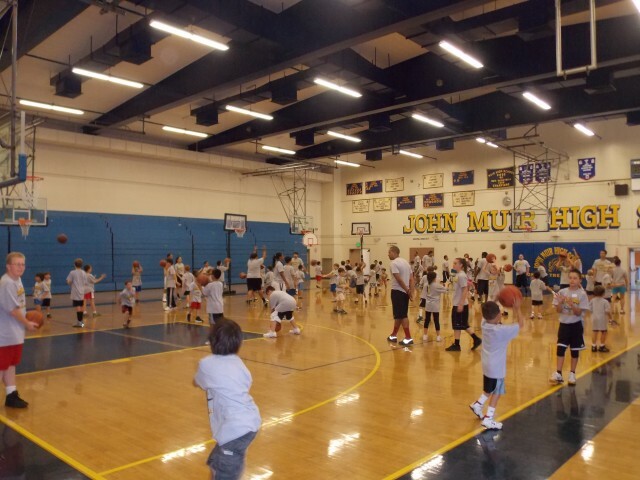 Our basketball camps strive to bring together players from the various Foothill Communities. We serve athletes from La Canada, La Crescenta, Altadena, Pasadena, San Marino, Glendale, Los Angeles, Sunland, Tujunga, Burbank, Eagle Rock and Los Angeles. We have no zip-code requirements or priorities. If your athlete is between the ages of 6-9 and is eager to attend, she may participate! What is Foothill Hoops Basketball all about? We emphasize fun, learning, confidence building, and character enhancement. Age appropriate skills, instruction methods, and competition levels are utilized. We strive to teach our players how to play winning basketball, without letting the desire to win sacrifice the aforementioned principals. We hope to build the skills, confidence, and love for the game of basketball that will translate into a lifelong relationship wiith fitness and physical activity. Player Placement: In the morning clinics, players are divided into small groups of 4-8 based on experience and skill. In the afternoons, players will be placed on a 5 on 5 team with players of their own age. Who Coaches? We utilize our highly trained and experienced staff of current and former high school and college athletes. Our diverse group of counselors consists of athletes from La Canada, Crescenta Valley, Glendale, Muir, Flintridge Prep, and St. Francis High Schools, among others. We strive to maintain an equal balance of men and women on our staff. Our 8 to 1 camper to coach ratio is the best in town! For more information on our current coaching staff, please visit the Meet Our Staff page. How Much? The registration fee of $275 per player covers the entire week. (That’s less than $10 per hour!). Current Flyers Travel Team members can attend camp at half price (50% off). We are a federally recognized, not-for-profit, 501c3, educational organization, and we will never turn away anyone due to a financial limitation. If your player is interested in the camp but your family cannot afford the fee, please contact us at info@foothillhoops.org with questions regarding financial assistance. What to bring: Please do not have your player bring his or her own basketball as it is likely to get mixed-up and lost among our equipment during the day. Please DO have your player wear a t-shirt/tank top, shorts, basketball shoes, bring plenty of bottled water, a sack lunch and at least two snacks each day. A positive attitude, willingness to learn, try new things, and meet new friends is also highly recommended! Is this camp right for my player? Beginners: Ensure that your player learns the correct habits early with our modified ball sizes, basket heights, and coaching techniques. With our unparalleled 8 to 1 camper to coach ratio, your camper will get the attention he deserves, giving him a positive start on his youth sports journey. Intermediate Players: Does your son or daughter already enjoy playing? Here she can refine her skills and get even better with each drill, game, and day. Your player will be placed in a clinic group with players of similar experience and ability and with coaches who understand where they are in their development. Advanced Players: On the first day of camp our staff will identify the most experienced players and group them together for morning clinics. In clinics, we will give our advanced groups extra challenges and introduce them to more complex skills and strategies, giving them that extra "push", but still within a healthy and friendly framework. We don't believe in a "one-size-fits-all" approach to teaching, and stations are adapted to challange those players who are ready to take their game to the next level. What makes the Foothill Hoops Camp unique?